This is a lovely little nanny cam which has WIFI capabilities so you can monitor your baby, elderly relative or even your pet while you are away from home. The DCS-820L doesn’t have every possible feature it could have, but it has more than enough to make it a great little baby cam to keep your family safe. It also works well as an in-house monitor, so you can observe your baby when you are at work or in another part of the house. Local storage with an SD card slot. IR night time visibility (16 feet). Sound and motion alerts via emails or SMS. Can be powered by a USB battery. How do you install the DCS 820L Nanny Cam? All you need to do is to download the FREE mydlink baby app for your iPhone, iPad or Android device and then follow the simple steps to setup the D-Link DCS-820L camera. You are then automatically connected to your baby, wherever you are in the world, 24/7. You can manage all of the D-link camera features from your mobile device, making life so much less stressful and helps you to stop worrying about your baby when you are on-the-go. 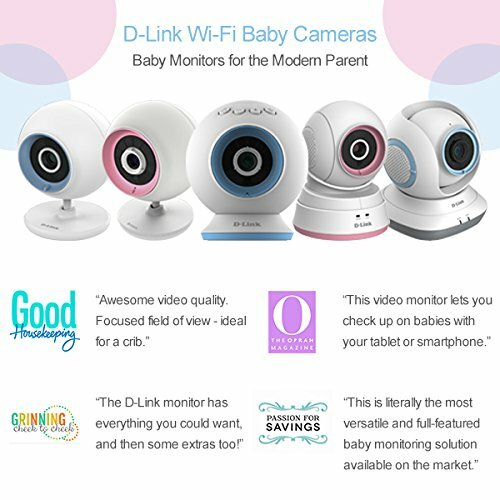 With the D-Link DCS-820L wireless camera you have 2-way communication so you can talk to your baby or your children (even your dog!) when you are the office or whenever you are away from your home. This can take a lot of the stress away from worrying whether they are OK or not, when you can’t be there to look after them yourself. It is also a great feature to have when your baby or toddler is unsettled in the nursery, because you can chat to them from your office and see them at the same time – helping them to calm down and settle until your partner or baby sitter can attend to them. With a x4 digital zoom (not just an app zoom as with many other nanny cams), you can move in for a closer look at anytime. So you can check on them when they are asleep or make sure that they are covered by by their blankets to keep them nice and warm. With the DCS-820L baby cam you have 5 pre-set lullabies which you can play remotely from wherever you are in the world. You can also load your own tunes, lullabies or even a bedtime story and play any of these to your baby or infant to help them drift off to sleep. This helps you to still feel part of the family when you have to be at work. Not all nanny cams come with an SD card slot, many make you save your images, videos and snap shots to the cloud. The DCS-820L however, gives you the ability to save all of your baby shots to the SD card, keeping them safe and letting you easily upload them to Facebook or save them to your PC or Dropbox. When you are on the go, it is great that you can receive alerts on your smartphone or on your tablet, whenever your baby is awake or unsettled. This means that you can talk to your baby if they are upset or play one of the gentle, soothing lullabies to help them settle again and drift off to sleep. Just because you can’t be there every minute of the day, doesn’t mean that you can’t still take care of your family in the best way possible. With the 16 ft infra-red night time vision with LEDs you can always check on your little one during the night and be sure of crystal clear vision. 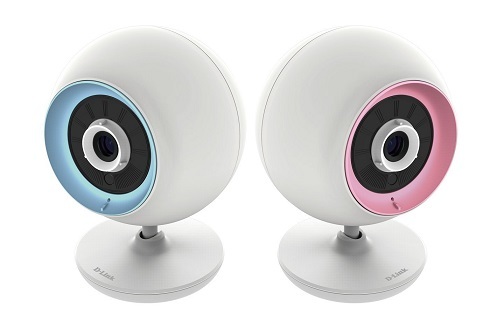 What do customers think about the D-Link DCS-820L nanny cam? Online reviews for the DCS-820L nanny cam are mixed with customers loving it and having no problems at all or having ongoing connectivity issues. This is a basic entry nanny cam, so it doesn’t have all of the functionality you might want in a nanny cam. Most people thought that the setup process was a fairly easy and painless process and they love the clear images, being able to talk to their baby when they are at work and the reliability of the D-Link camera. I have tried almost every high end baby camera and this is the best one in terms of overall features, video quality and ease of use. This is my 9th camera from d-link. They have all worked well. This thing is awesome!! I love how you can change the ring from pink to blue. Easy to setup and works great! I love that the app is on my iPhone. Not easy to use. My iPhone couldn’t connect to the camera. Very frustrating. Picture quality is good and it’s easy to set up, but the app keeps freezing! The D-Link DCS-820L is a nice little entry level nanny cam with a digital zoom, an SD card slot and plays 5 pre-set gentle lullabies. You can also upload your own selection of lullabies or bedtime stories and play them remotely to help settle your baby. This nanny cam is one step up from the more basic DCS-800L camera, and unless you want pan & tilt or a temperature sensor (which are in the DCS-850L and the DCS-855L D-Link cameras), then this is a great little nanny cam that should fit the bill for most parents. FYI: Some customers do have problems with connectivity, however upgrading the firmware seems to sole this problem for many customers. Read my #1 recommended nanny cam review here – the iBaby M6. 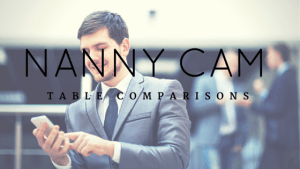 Compare all of the different nanny cams here.